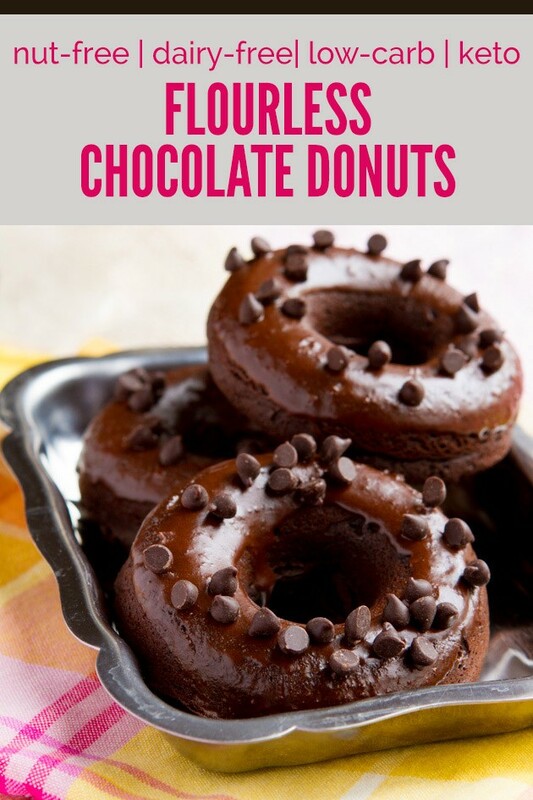 Keto chocolate cake donuts without sugar or flour – no almond flour or coconut flour either! Boosted with keto Genuine Health fermented vegan protein+ powder, drizzled with dairy-free keto chocolate sauce. It’s summer (officially!) and you’re thinking, ‘do I really need to turn my oven on for this?’ I think you should, you must! Wait, did I just try to convince you to make (and eat) something chocolatey? 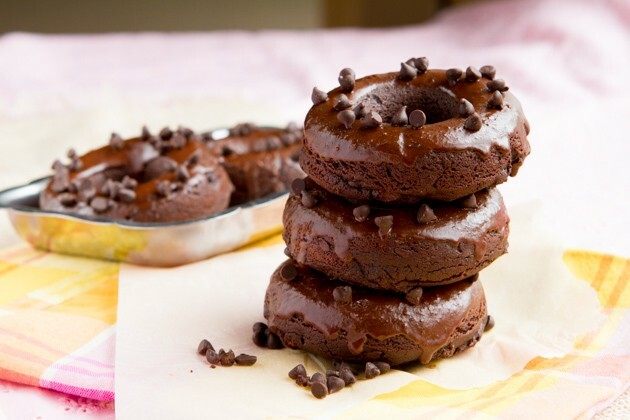 Whether you’re waiting for a colder day, or you’re going to crank your oven up to 350F and bake these flourless keto chocolate donuts in your underwear; no judgement, I hope you enjoy them! If you’re horrible at surprises (like me) than you probably scrolled down to the recipe to see exactly what these keto donuts are made out of – no flour, no nuts, no dairy, no grains… what’s in this keto recipe, Leanne? I’m glad you peeked. So, I used a base of green plantain for this keto recipe. Why? 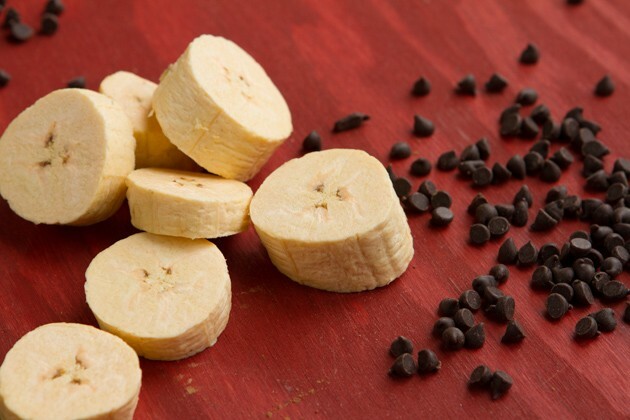 Because plantains are awesome. And the green ones are really low in sugar. They’re a safe starch, like the ones Michelle and I chatted about in this weeks’ Exercise + High-Fat, Keto video and are great for evenings when you need a little boost in your carbs, if you’re practicing that sort of thing. To leaven things off, I used keto-approved Genuine Health fermented vegan protein+ powder in place of flour. Just a touch will do you good. 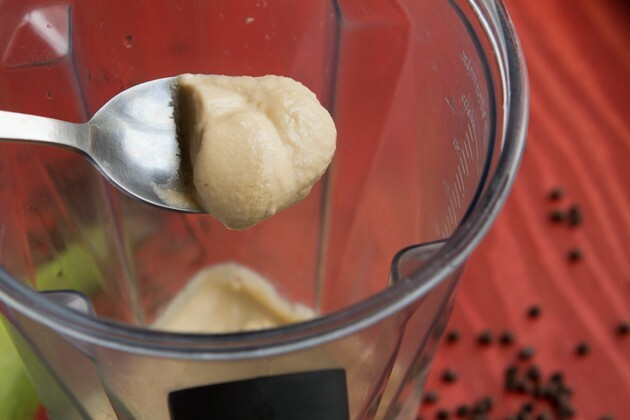 The reason I chose to use Genuine Health fermented vegan protein+ powder in this recipe is because many of you have been asking me for higher protein treats that fit The Keto Beginning program. 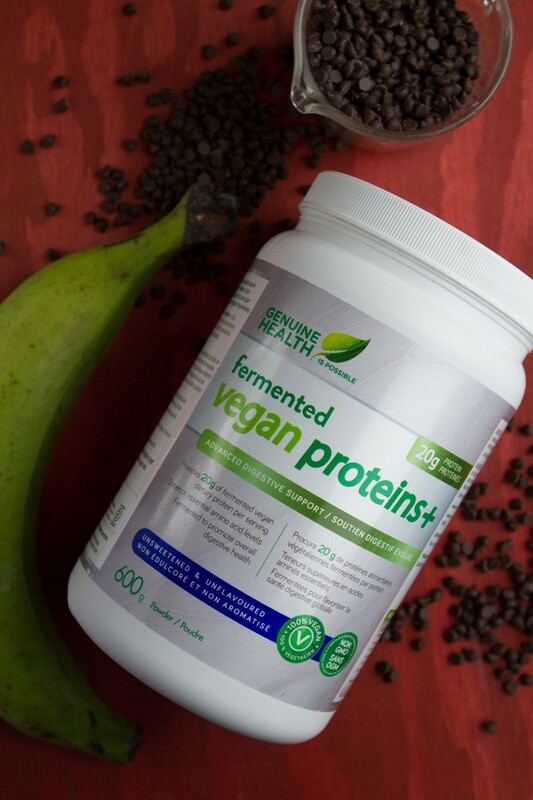 What I love about Genuine Health fermented vegan protein+ powder is that it’s silky smooth. I can bake with it without the fibers getting in the way and affecting the end result. And, for those that are sensitive to grains, the ingredients in this powder have been fermented so; in many cases, it won’t affect digestion like other grain-based protein powders out there. Allergic to grains? I have you covered. Check the notes of this keto recipe. The average cake donut has about 40 grams of carbs and 20 grams of sugar. This donut is about 30% of that. There’s no sugar, no grains, it’s keto, and you’ll actually feel good after you eat them because the ratio of macros is completely flip-turned upside down. Lots of fats, minimum carbs, moderate protein, totally keto, thanks to the fermented protein powder. This keto recipe is highly adaptable to fit your eating style. I’ve included notes below this keto recipe if you want to swap out certain ingredients for ones that suit you and your eating style better. 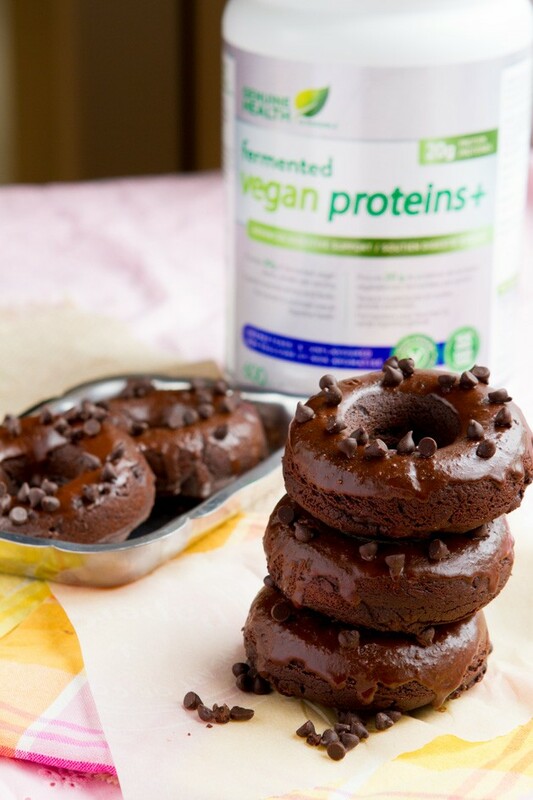 Grain-free, sugar-free, keto cake chocolate donuts boosted with Genuine Health fermented vegan protein powder, drizzled with dairy-free chocolate sauce. Preheat oven to 350F and lightly oil a 6-count donut pan. Set aside. 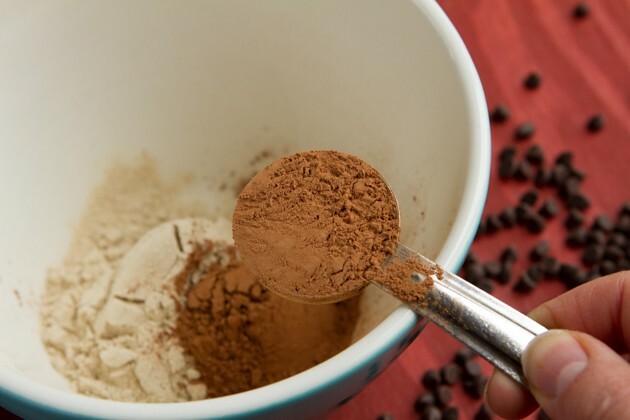 Add fermented protein powder, cacao powder, baking soda and salt to a medium-sized bowl. Whisk to combine and set aside. Add chopped plantain, room temperature eggs, melted coconut oil and vanilla to the jug of your high-powered blender. Blend until smooth, about 1 minute. Meanwhile, melt chocolate. Then, add melted chocolate to the blender. Whip until combined. Drop plantain mixture in with dry ingredients. Mix with a spoon until incorporated. Spoon batter into a piping bag or large plastic bag and cut off the tip. Pipe the batter into the prepared donut pan, ¾ of the way up the mold. Once complete, place in oven and bake for 10 minutes, or until toothpick inserted comes out clean. Allow to sit in the pan for a couple of minutes before transferring to a cooling rack to cool for 1 hour. Meanwhile, add frosting ingredients to small, wide bowl. Drop each donut; one by one, into prepared frosting. Place on cooling rack and top with optional chocolate chips. Serve immediately, store in the fridge for 2-3 days or freezer for 2 months. No-Sugar Dark Chocolate: you could replace this with ¼ cup cacao powder and ¼ cup melted cacao butter. If you go this route, there will be no sweetener in your chocolate. You could add ¼ cup xylitol to this keto recipe, adding to the melted chocolate mixture while melting. Grain Allergy or Paleo: fermented grains are in the protein powder. You may or may not react to it. If you don't want to play with fire, it's all good. 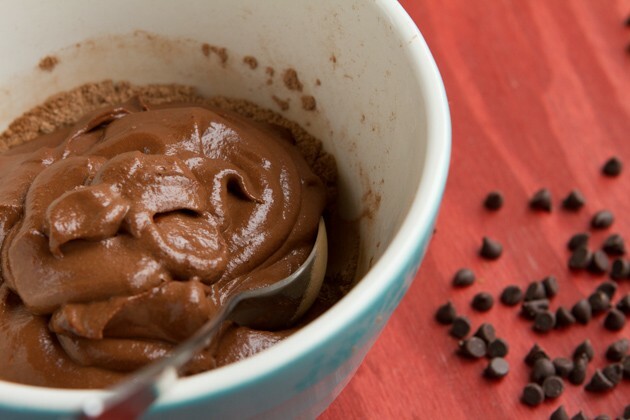 You can use extra cacao powder or use your favorite grain-free protein powder. Green plantains are woody, very hard. They can be a bit difficult to peel. I like to run a knife along the side and peel sideways. Blended with a bit of eggs and oil, they get really smooth. 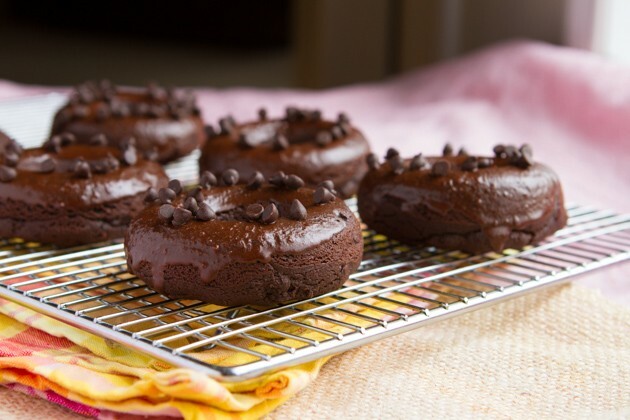 They’re fibrous and make the best base for these flourless keto chocolate donuts. You can see just how creamy the plantain batter gets, almost like mousse! 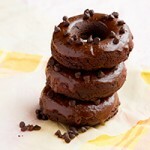 Add to your donut pan, bake, cool, dip in frosting and great ready for some keto donut action! Of the protein powders you have at home, which are your favorite to use for baking? Do you like baking with protein powders?